Fees associated with Indian PCT national phase entry as well as other patent fees are available in the fee calculator. The time limit for the PCT national phase entry in India is 31 months from the date of priority. This term cannot be extended. 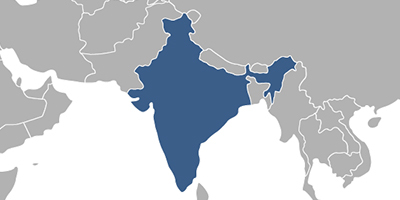 The official language of the PCT application in India is English and Hindi. - details of the priority claim: date, application number and country. The time limit for submission of the Priority Document is 31 months from the earliest priority date. For National Phase applications Form PCT/IB/304 issued by IB/WIPO constitutes confirmation of submission of the Priority document and is sufficient. However, if the priority document is not in English, the time limit for submission of the English translation of the priority document is likewise 31 months from the earliest priority date. Where the priority document (and its English translation, if applicable) is not submitted within the time limit of 31 months, the same is required to be submitted within three months from the date of invitation received from the Indian Patent Office. The Power of Attorney must be submitted within the period of three months from filing an application. Legalisation or notarization of the Power of Attorney is not required. If the applicant is not the inventor, the Declaration of Inventorship (Assignment deed) should be provided within six months from the date of entering PCT national phase. The legalisation or notarization is not required. Information about family patents (a set of patents taken in various countries to protect a single invention) such as application numbers and dates thereof, publication numbers and dates thereof, grant dates and patent numbers are required to be filed before the expiry of six months from the date of PCT national stage entry. Patent applications in India undergo formal and substantive examinations. A request for the substantive examination of a patent application in India should be made within 48 months from the date of priority. -by Public working for the purposes of reasonable trial only. Patents in India are valid for 20 years from the date of filing. The official grant fee is not stipulated. The annual fees for maintenance (renewal fee) of Indian patent in force for the 3rd to 20th years should be paid after completion of the patent registration procedure. It is also mandatory to file the Working Statement for all granted patents with the Indian Patent Office by March 31st each year providing information about the extent of the commercial working of the patent in the previous calendar year. It takes an average of 4 years from filing to granting of a patent in India. It is currently not possible to obtain utility model protection in India. The applicant is required to have an address for service in India. For foreign applicants, it is recommended to perform PCT national phase entry in India through an agent, a registered Indian patent attorney. Online database for Indian Patents Search.